I'm all all fired up this morning because I am headed to the mountains this evening. That's right, it's snowboard season. This is what I use to LIVE for. If I didn't have a baby right now I would have hit the slopes the second the mountain opened. Ben and I will be going up there with Lyla. So we will have to take turns taking runs. So with all my excited energy I wanted to get in a quickie workout before getting in the car heading to slopes. Stretches with baby and done! Last season I had just had Lyla and there was barely any snow left. Remember I'm in southern cali. 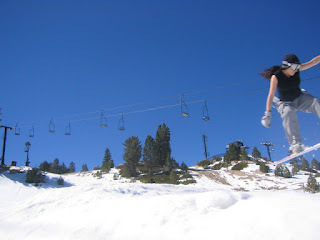 Here is a pic of me hitting the slopes as soon as doctors gave me clearance since I had a C-section. I got 2 hours total in for the whole season. 8-( Yay for today!!! After my 3 mile walk/jog one of my girlfriends came over to check out my new little garage gym. My friend and I were playing around with the pull up bar like we were kids. I was also pushing Lyla around in the little radio flyer wagon in between messing around with pistols and swinging on the bar. I then wanted to try a one arm push up. I decided, what the heck, let me give it a whirl and fall flat on my face. Well surprisingly I did it! Then I did it again and then on the other side! Woo hooo. Hmmmm how did this happen since I haven't really trained for one arm push ups?? My guess is tension or lots and lots of stress built up. I have been practicing pistols and pull ups for the past 2 weeks, which both require tons of tension. I just used the same breathing and tension technique to the push up and I actually did it. There was definitely some snap, crackle, and pops going on. Strength works in mysterious ways sometimes. I strongly feel that the mind can take over and provide you with the extra strength in time of need. Especially when you have lots of built up energy inside that is ready to explode! The story of my life. I have been feeling pretty good these past couple days. During the holiday season I am not as busy so I have some more down time. Even though my baby tends to tire me out, I am feeling rejuvenated! Today I squeezed in two mini workouts. It's amazing how wonderful the mood and energy picks up even with just these short practice sessions! I love it!! !